The other day I changed my camera settings so now my latest batch of photos are all crap. It's enough to make me want to flip a table! Okay not really, but I am still pretty annoyed. I should probably stop messing around with my settings when what I have already works totally fine. Anyway, yesterday I finally got to drop by one of my favorite places in the world - Deovir in Megamall. I wasn't looking for anything in particular but I was ready to snap up anything that's interesting. And did I find something! 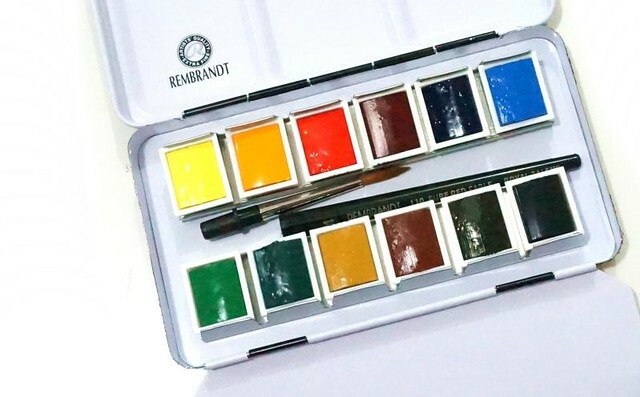 It's a Rembrandt Water Color Box that's about P3,150. 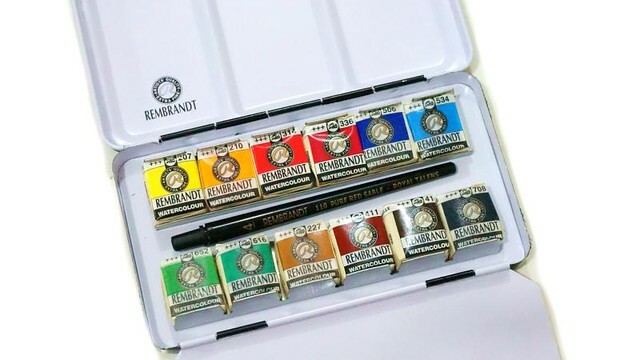 It's expensive but I've always wanted a Rembrandt set so I thought hey, I had a long day, I totally need a new box of paint. And here we are. 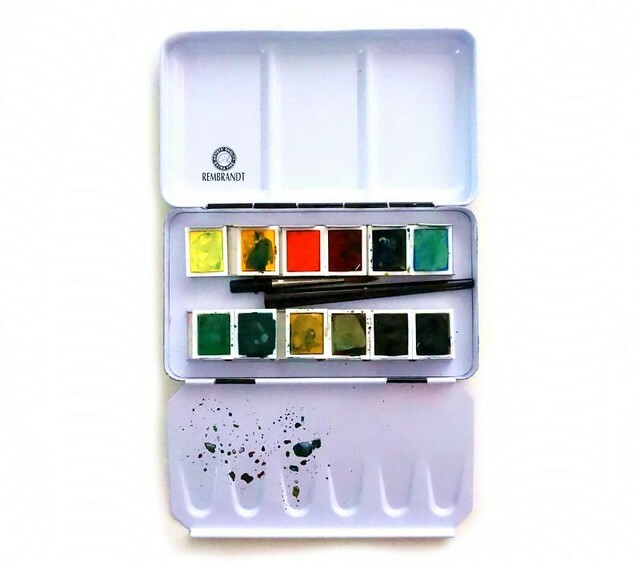 I know you're not super interested in watercolors per se (this is a beauty blog after all) but I still want to post this because I am happy with this box. Also it's frustrating when there are barely any reviews about this particular product. I found, like, one. Hopefully people who are interested can find this post and see for themselves before they decide to buy it. Rembrandt is a Dutch brand for artists, with high quality paint made of the purest pigment. This beats all of my other water color pan sets in terms of pigmentation or transparency (as is required in some colors). I have Holbein, Van Gogh, and Sakura. It's just as good as Winsor & Newton, though the set I have is composed of tube paints. I also love how small it is with its foldable flaps. Closed, it's just like two iPhones stacked on top of each other. 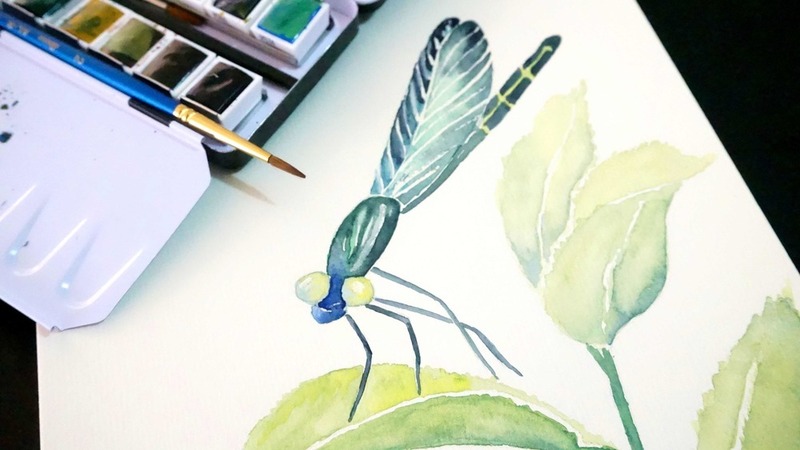 Really travel-friendly and super useful if you just enjoy painting outside. It comes with a compact red sable brush that's pretty good although it doesn't snap in when you're ready to use it. Weird. You'd think they'd figure out something so simple. Here's something I made using these Rembrandt paints. Just a random scene while walking my dog. 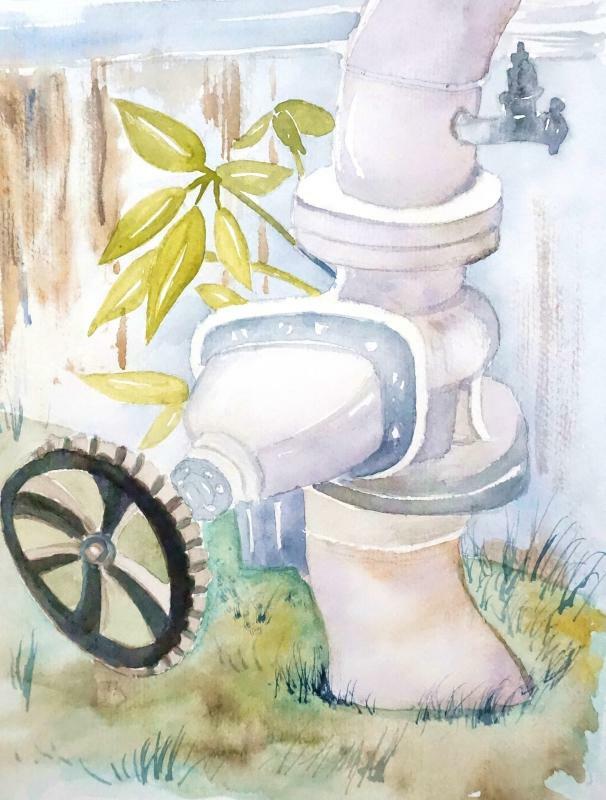 I take a lot of pictures of things that appeal to me visually, so that when I get down to paint, I don't get stuck trying to come up with something wildly awesome. Sometimes, it's easier to just take things at face value and deal with them as you see them, instead of over-thinking. So! Speaking of new discoveries, I recently started (obsessively) listening to Kate Torralba's album on Deezer! Seriously, that album is running my life right now. But let's talk about Deezer first, a global music-streaming service that Smart recently partnered with for their postpaid subscribers! Available in more than 180 countries around the world including the Philippines, Deezer provides one of the most exciting music streaming experiences thanks to its intelligent recommendation algorithm, which allows users to discover songs that are perfectly suited to their unique tastes and lifestyles. I've been using Deezer for the fast couple of weeks, and even on 3G the streaming is pretty fast. It also has all the music I can think of! If you're thinking of getting a new phone for post paid, you might wanna consider getting it from Smart because of the Deezer Premium subscription. For two years! Users can choose from a range of high-end smartphones that include the Sony Xperia M (Plan 1174), the Nokia Lumia 1020 (Plan 1675), the Sony Xperia Z2 and the Samsung Galaxy S5 (both at Plan 2175). Now, let's get to Kate Torralba's "Long Overdue". We know her as a fashion designer, but her foray into music is really something. I think the album came out last year - I only got to listen to it this week. I love the song "Pictures" waaaay toooo much now. Hugot! Daming feelings! I also love "Northfleet" and "Under My Stars". Do listen to her album here, and while you're at it - get a Deezer account! It's totes free on your browser, but you can get a Premium+ plan if you want to play unlimited music on your mobile devices as well. Enjoy. ^_^ Have a beautiful, musical, and inspired Sunday!